Since I have a daughter that is interested in science I wanted to share some of the interesting women in science that I have come across. I don’t mean for this to be a full biography of them, that is what Wikipedia is for, but rather a starting point for people to do their own research. So these will have a lot of links to articles and videos with some text to explain why those links are interesting. Back in 2012 I wrote a guest post on The Momma Knows called “E is for Exoplanet”. In it I talk about the Kepler Space Observatory. Sara Seager was one of the people that work on Kepler. On finding that it lead me to other exoplanet projects that she is leading or involved with. A number of those I was already aware of. As a result I decided that my first of these posts should be on her. In that 2012 article I stated that there were 832 exoplanets, now there are 1826 confirmed and 4229 that probably are but they haven’t enough data yet to confirm. Above is a pin that has a handy chart of the types of planets they have found. The big numbers include the ones they don’t have enough data to confirm. The little numbers in the lower right are confirmed planets. Lets start with the Wikipedia article on her. She is the Head of Planetary Group in the Dept. of Earth, Atmospheric, and Planetary Sciences at MIT among other titles. It is interesting to read but the videos are better and more up to date. The first video is the newest that I could find. She talks about what we know so far about exoplanets and some future missions like TESS. This video discusses TESS and the cube satellite ExoplanetSat. She also talks about some of the weirder planets that they have found. 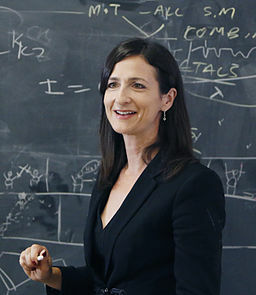 She is the Principal Investigator on Exoplanetsat and a Co-Investigator on TESS. The next video is a TED talk and covers some of the same material as the earlier videos but it was the first one I found and it compactly covers the major ideas. The article also gave me an answer of a question I had about ExoplanetSat. I had wondered why it hadn’t launched yet. It turns out that they are waiting on funding but they are close to being able to launch. The next video has to do with an award that she received. The cool part is that she has a ExoplanetSat sitting on her desk. She also talks a bit about how she became interested in Astronomy and how she would like to see more women in the sciences. What could aliens see, looking at earth from afar? If we can not go there, why look? Hopefully this will give people an idea of what is out there and ideas to research. 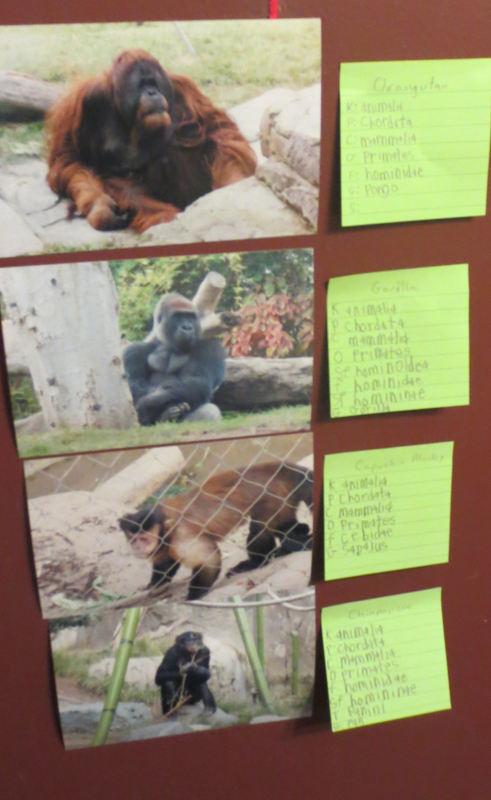 First we figured out the names of the animals in each of the photos. I also included our photos from Seaworld. I put post it notes on the backs of each photo. Once we had the names, or as close as we could remember. I know that some are not exact, for example I’m not sure if we have African or Asian elephants. 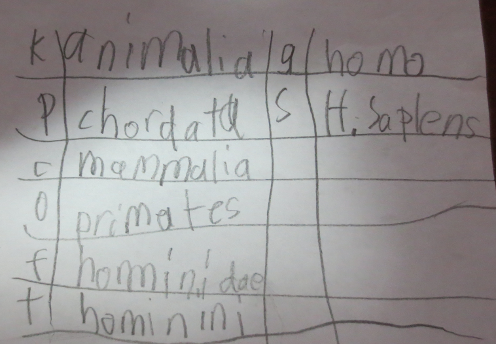 I then had Philip look up each animal and write the classifications on the post it note. 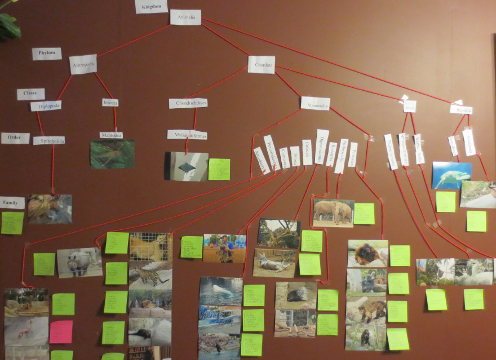 This could have gone faster but he felt it necessary to read each Wikipedia article on each animal. We then sorted the pictures, first by Phylum and then by class, order and family. We were only able to organize down to the order level due to the size of the wall I chose. We then created labels for each unique classification. We then organized the labels and the pictures on the wall. My wife said it made it clearer for her as well. It is one thing to read about how we are all interconnected but another to see it up on a wall. 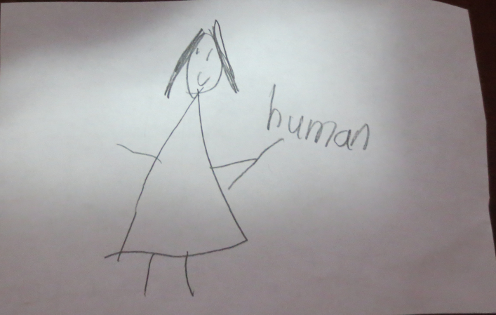 My daughter who is grade 4 then went and looked up human and made her own picture. She also figured out where it would go on our display. Overall I would say it took between 10 and 15 hours to complete but that also counts the extra reading that he did. I am fine with the extra but it wasn’t necessary for the project.